I just returned from Cape Town, South Africa, where I attended the IFLA conference (for librarians worldwide) and had the opportunity to do several talks about poetry in a variety of locales (including for the newspaper and national radio). One thing that was universally popular was the whole idea of Poetry FRIDAY! 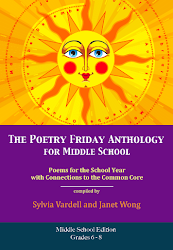 The idea of pausing for poetry at the end of the week just grabbed everyone across the board. And I just love that! So here we are celebrating another Poetry Friday. Welcome, everyone! Here's a poem that I shared several times that was a always a big hit-- along with the "Take 5" activities for introducing and sharing this poem, "Welcome" by Linda Kulp Trout. 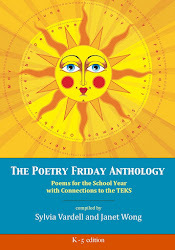 It's from The Poetry Friday Anthology for Celebrations, of course! And all these images are available on Pinterest, too. 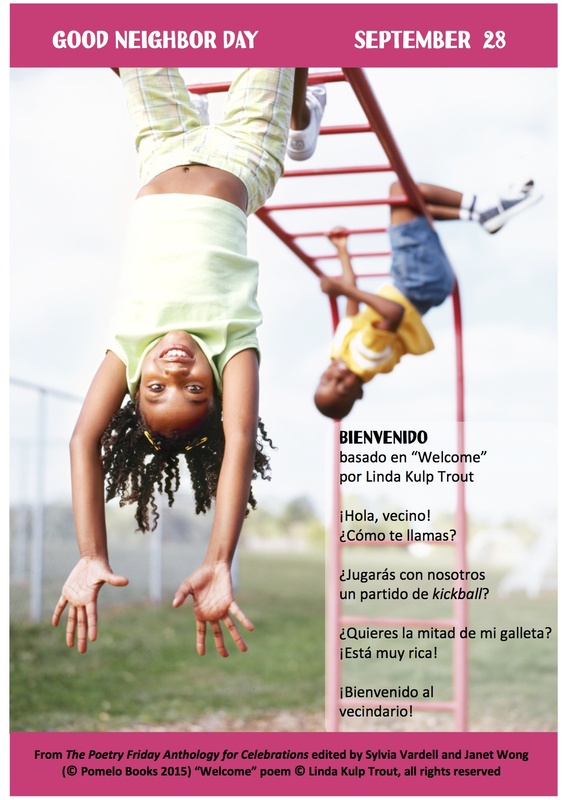 And if you'd like to share the poem in Spanish, here is "Bienvenido" too. 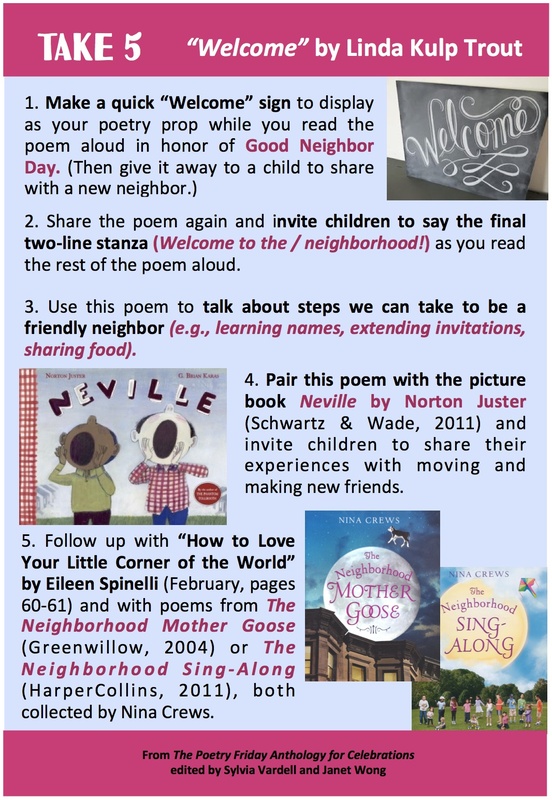 Now you're all set for celebrating Good Neighbor Day next month (on September 28). Meanwhile, dear poetry neighbors, please add your link to your Poetry Friday post this week below. I'm not sure if this is where I'm supposed to post my Poetry Friday link? A wee-bit confused because of that Mister Linky's Magical Widget... so if I've done it wrong, please let me know. 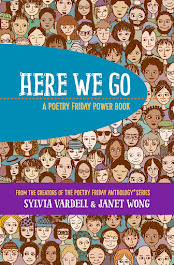 Thanks for hosting Poetry Friday, Sylvia, and for sharing the we;come poem. 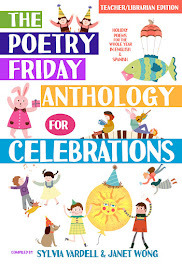 I love the idea of the Celebrations anthology. Welcome Home, Sylvia - thank you for hosting so soon upon your return. And thanks for sharing Linda's wonderful poem, and for being such an amazing ambassador for children's poetry! Ack! And I was so busy doing everything 'right' that I forgot to respond to your post. I was also checking out last week's post, with you lovely poetry publications. Sounds like a wonderful and rewarding time for you. The voice in Linda's Welcome poem is lovely. Happy Poetry! Happy Friday! Thanks for spreading the love around the world! 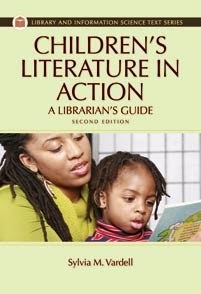 Thanks for hosting and always being an advocate for children's poetry. Well, hello neighbor! I always feel welcome at Poetry For Children, Sylvia. :) Thanks for hosting today, and for sharing Linda's sweet, perky poem with Take 5's. Thanks for hosting today and sharing Linda's poem. I love poems that use simple language so perfectly. Thanks too for being the #1 Ambassador of Children's Poetry! Thanks for hosting, Sylvia. And thanks for sharing poetry love far and wide. I love this post, and your site! 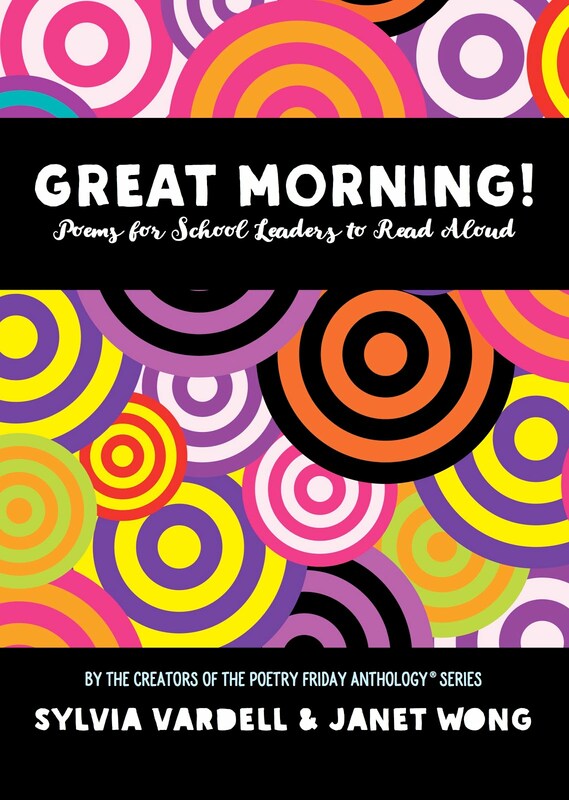 Happy Poetry Friday and thank you for some great ideas!Perfect timing! Welcome back, Sylvia, and thanks for hosting today! What an amazing experience you had. 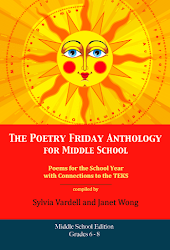 I love that Poetry Friday is soon going to be a "thing" around the world thanks to you and Janet! 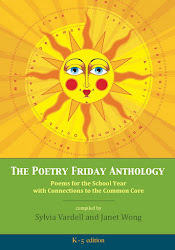 Love hearing that the idea of Poetry Friday was so widely embraced. 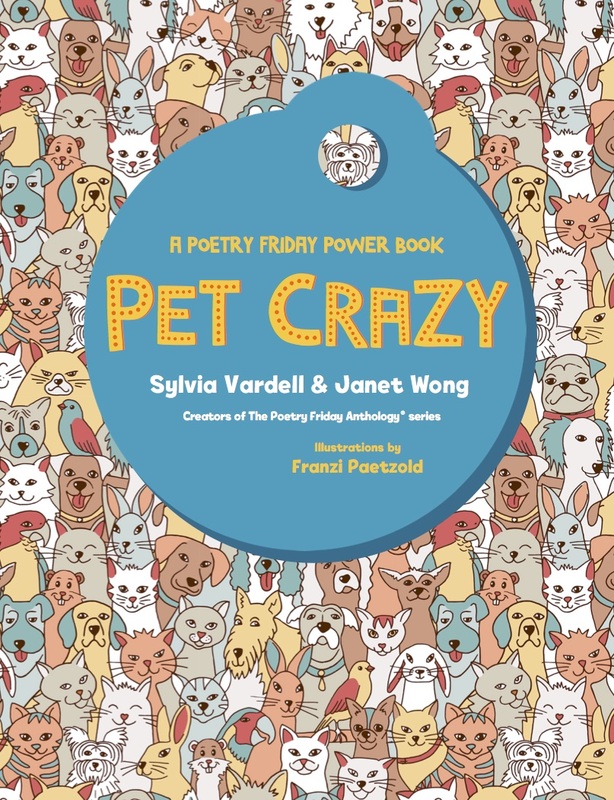 You and Janet are the best poetry ambassadors! At Alphabet Soup, I have an interview with Susanna Reich about her new Beatles picture book biography. Also giving away a free copy. Thanks for hosting today, Sylvia, and sharing your poetry love. Thank you so much for sharing my poem in such a beautiful way, Sylvia! I can't wait to show my students! You made today a true celebration! 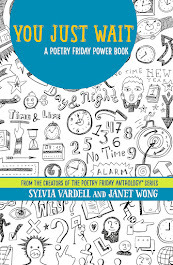 Sylvia, it is so exciting to hear that you traveled to South Africa and became poetry ambassador of good cheer spreading the news about Poetry Friday. Linda's poem and ideas are a wonderful introduction to the joys of poetry. 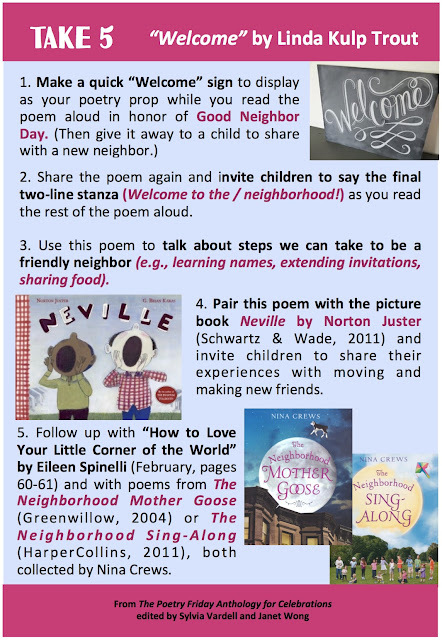 Such a perfect poem to share, now that you're home, now that Poetry Friday is here, and now that kids are heading back to school! Thanks for hosting, Sylvia. I'm sharing a post from this past Tuesday, about Laura Purdie Salas' new book on poetry. Poetry Friday is the most welcoming place on the Internet! (And yes, half a cookie sounds delicious! The breakfast of champions!) Thanks for hosting and for doing what you do *all over the world*! WOOT! Go Sylvia!! I've been following your travels online and I love learning Poetry Friday has gained such acceptance. Great welcome poem! Thanks for hosting. I've enjoyed seeing about your trip online, Sylvia. What a fabulous time it must have been. It's wonderful that they were excited about Poetry Friday. Thanks for hosting, and sharing the Welcome poem by Linda. Thanks for hosting today Sylvia. 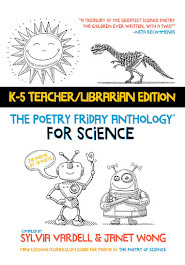 How wonderful to be spreading Poetry Friday worldwide! Thanks for hosting today. Cape Town sounds like it was wonderful. Today I'm sharing a favorite by Bobbi Katz. Thank you for rounding up the poetry for this week. I'm sharing a second collaborative piece, written with Mary Lee Hahn and Steve Peterson. 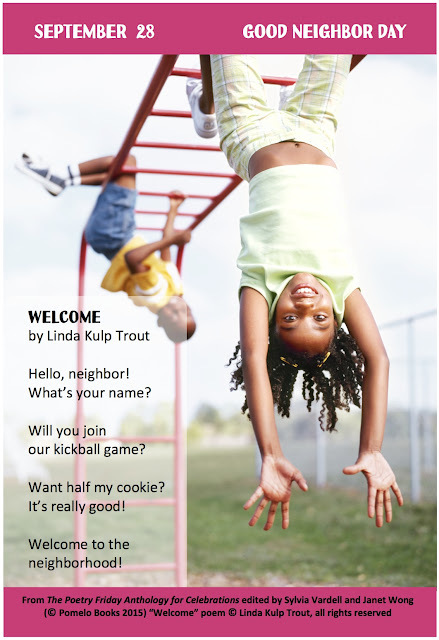 Love Linda's welcoming poem--welcome back to you, and thanks for hosting!